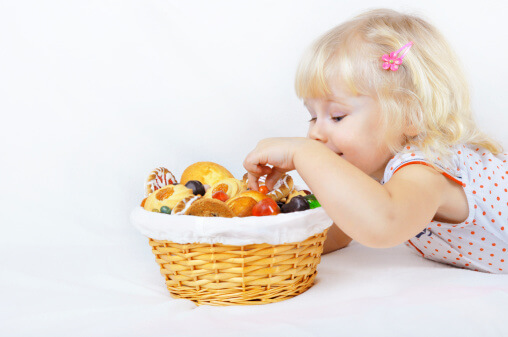 The effect of sugar intake on children’s behavior is a hotly debated topic in pediatrics. Parents and educators often contend that sugar and other carbohydrate ingestion can dramatically impact children’s behavior, particularly their activity levels. Physicians, on the other hand, have looked at controlled studies of sugar intake and have not found hypoglycemia or other blood sugar abnormalities in the children who are consuming large amounts of sugar. So how do sugar and behavior go together? An interesting article appears in the February 1995 edition of the Journal of Pediatrics. In contrast with other research teams, William Tamborlane, M.D., et al, of Yale University report a more pronounced response to a glucose load in children than in adults. It is commonly acknowledged that as blood glucose levels fall, there is a compensatory release of adrenaline. When the blood glucose level falls below normal, the resulting situation is called hypoglycemia. Signs and symptoms that accompany this include shakiness, sweating, and altered thinking and behavior. Tamborlane and his colleagues demonstrated that this adrenaline release occurs at higher glucose levels in children than it does in adults. In children it occurs at a blood sugar level that would not be considered hypoglycemic. The peak of this adrenaline surge comes about four hours after eating. The authors reason that the problem is not sugar, per se, but highly refined sugars and carbohydrates, which enter the bloodstream quickly and produce more rapid fluctuations in blood glucose levels. A recent study supports the idea that a breakfast with a lower sugar load may improve short-term memory and attention span at school (Physiol Behav, 2007; 92: 717-24). Giving your child a breakfast which contains fiber (oatmeal, shredded wheat, berries, bananas, whole-grain pancakes, etc.) instead of loads of refined sugar should keep adrenaline levels more constant and make the school day a more wondrous and productive experience. Packing her/his lunch box with delicious fiber-containing treats (whole-grain breads, peaches, grapes, a myriad of other fresh fruits, etc.) may turn afternoons at home into a delight. Are you convinced the reason for your son or daughter’s rowdiness lies in a box of Milk Duds? You?re not alone. Many concerned parents and health organizations believe there is a link between a child’s diet and behavior. The latest group to join the debate is the nonprofit Center for Science in the Public Interest, which recently released a report charging that the government, professional agencies and the food industry have been ignoring evidence that diet affects behavior. However, the majority of studies so far haven’t found a connection, and most in the medical industry maintain there is no known link between sugar and hyperactivity. is it possible to get the reference sheet for the above article.. i would like to look at the mentioned studies. Here is a link to the article Dr. Greene based the article upon — The influence of the glycaemic load of breakfast on the behaviour of children in school The influence of the glycaemic load of breakfast on the behaviour of children in school. In an accompanying editorial, Laura Schmidt – a professor of health policy in the School of Medicine at the University of California at San Francisco – states, “Sugar has adverse health effects above any purported role as ’empty calories’ promoting obesity.” She commented that too much sugar does not just make people fat, it can also make them very sick. Dear Dr. Green, I am a teacher in An international school in Germany. I see a lot of children in my classroom having lollipops and other high in sugar treat every day. I am looking for a good article I can use to put into our news leter to get the parents attention. A lot of these children have a multitude of problems going on. Just one illustration; a boy with ADHD and other issues got back from a psychologists visit the other day carrying a cotton candy. For the rst of my classes he had the hardest time to do anything. Is here any article you can advise to put into our newsletter that states the latest scientific research to maybe convince all parents that sugar does not belong in a child’s diet and especially not in school? You are welcome to distribute this article to parents if you would like. You can find more on the link between sugar and behavior from Robert Lustig, MD. I have a 7 yr old with ADHD, ODD and Sensory issues. Over the last few weeks we have noticed extreme mood swings and the ODD is worse in between when he eats breakfast and before he eats lunch. Once he has had lunch or a snack he is back to his “normal” silly self. Could this be a correlation between normal sugar levels effecting his behavior or could the sugar levels be making the ODD behavior that much worse? The sugar issue is tough these days. Corporations sponsoring their sugary products toward athletics programs that involve children has confused a generation about what it means to be healthy. Children will take the habits we enabled them to build into their adult lives, where diabetes and heart disease will continue to be the norm. My kids are on swim teams where sugar is the staple in foods to keep the kids going. USA swimming is sponsored by Nestle’s chocolate milk. We do everything we can to minimize their sugar intake, but when the organizations that run the athletic programs support poor nutrition, children will continue to develop poor nutritional habits. Leadership at the top of these organizations is where change needs to happen. Sugar is addictive and advertising works. The combination makes sugar harder to avoid and easier to get. We knows kids that have too much sugar have trouble learning, sitting still, paying attention and behave poorly as their bodies process the sugar. Now we need the support of leaders in influential positions to help parents raise well adjusted educated children. Your article seems to totally fit with the behavioural issues we are having with our 8 yr old son. If he doesn’t eat properly he turns into an uncontrollable monster, which is exactly what happened last weekend. He remained in this state for over two hours til my husband managed to get him to eat a bowl of porridge and golden syrup, and the result was like flicking a switch in his brain, and within two minutes of starting to eat. Thank you for your article, it has been a revelation for us. We have an appointment with our family doctor next week and are now in a position where we know what the problem is and need advice on how best to manage it. We were fearing a diagnosis of a serious mental health issue, it feels like a new day has dawned for us. This is great news! So glad you we able to find a connection. I strongly recommend you keep a detailed food diary (especially between now and when you see the doctor) and look for connections. It may be sugar and / or other things. Some kids have a lot of problems with food dyes, for instance. It’s only has you track diet and behavior very closely that you can find some of the more subtle links. Mr Green my daughter is 15 last night she had a bag of very sugary sweets after a few moments she started to act very wearily racing about and being very silly i had taken them away from her and she went very red and kept on asking for them back as she could not cope not eating them. when we got home she went to sleep on the floor and then we told her to go to bed but when she got up the next morning she said that the last hour or so she couldn’t remember what she did do i need to get her tested as each time she has the sweets she does the same i do tell her not to get them. It sounds like it would be very wise to have your daughter tested. It’s difficult for some kids and teens to give up sweets, but having clinical data showing that is it harmful to her might help her decide she doesn’t want to do things that hurt her health and make it difficult to maintain the consistent energy levels she needs to function. I have roommate that has 2 daughters 1 is 12 and the other is 9 years of age . The 9 year child consumes a lot of sugar everyday , if she has cereal she pours sugar in it which I would measure at a half of a cup . then she will eat candybars ect… Well I noticed shortly after very erratic behavior , she runs thru the house stomping ,beating on her sisters door throwing things at her sister and ffor no apparent reason . you ask her stop and she gets eeven worse . her dad tell her stop and will get even more defiant . then when come off of the sugar she complains of a stomach ache or a head ache or both . I try to tell my roommate and best friend that it is the sugar that she consuming but he does not believe me , I offer to show him Dr. Greens writings on the subject but he will not read it. Even at this very moment I’m writing this I have locked myself in the bathroom with her beating on the door to irritate me , it was her older sister and she thinks now time for me . it’s very hurtful that her dad want try to educate his self on this and cut out her sugar intake make sure that she hasa more balanced diet . . It is so bad that have no choice but to move out. My children that I raised , 4 boys are grown now . I always read and tried to educate myself as being a single parent and would to share this story , parents please be involved with your child or childrens diets it is so important because it can have a very catastrophic affects in their health and behavior which can cause them mental and physical problems in life not to mention rollover life’s of others and misfortune on tthemselves and others and the truth of it that we as parents were the true cause of their health and behavior !! Thank You , Robert V.
You were very smart to educate yourself about your children’s health. Sadly, you can’t educate other parents if they are not open to learning. Here is a suggestion — ask your room mate to do a simple test. Ask him to reduce the child’s sugar intake for one week. Tell him it things aren’t better in a week, he can always go back to the way things were. Offer to help preparing food for the kids and offer food that’s not sugar laden. For the experiment to work, make sure you cut out foods with hidden sugars, as well. While you’re at it, remove good with artificial colors. These can impact some children’t as you’ve described. It would be a shame to eliminate sugar, but not food coloring and not see a change in behavior. It may take a lot of work to convince your room mate to try a trial of very limited sugar and artificial food coloring, but if you can do it, you may save your friendship and give the child a much better life. I have a 4 yr old, I adopted and he was having severe behavior problems, it took along time but finally figured out that several hours after having sugar he was really angry, yelling, screaming having fits, so I contacted the school and let them know I would provide his lunch, there was a tremendous difference. Is this possible, that this child can’t handle sugar, he becomes confused, irrational, argumentative , etc.? What happens inside baby when parents let them dig in to a first birthday cake? Isn’t that seriously unhealthy to encourage that much sugar entering the body? Amandeep, I’m not concerned about the sugar that is naturally present when a 14-month-old eats a piece of fruit or drinks a glass of milk. It’s ‘added sugar’ or ‘free sugar’ I’m concerned about: the sugar that’s either added into foods or that’s concentrated when fiber or other ingredients are taken out (as in fruit juice). Children don’t need any added sugar. If they do get it, I agree with the American Heart Association’s recommendation that they average no more than 3 or 4 teaspoons a day. This would be 12g to 16g on a nutrition label. For comparison, just 1 tablespoon of typical ketchup can have a teaspoon of added sugar! This also means no more than 4 to 6 oz a day of fruit juice for kids up to age 6. Eat Real is a great resource to learn more about sugar and kids. I’m on their Board. What is the proper diet for ADHD at age 6? I totally agree!! I’ve been ill for 30 plus years due to these poisonous substances that are in EVERYTHING you buy at a grocery store. Dozens of doctors over the years gave me NO advice on anything!! You are correct, I went to a D.O. and he solved the mystery in 5 minutes!!!! Dr.s will answer for their bought and paid for advice from the food, drug and medical industry. I went to my regular dr and she was NOT happy with my decision to go the paleo diet, because it started healing me within 48 hrs. western medicine is a business, period!! Even Hippocrates knew that the food put in the body would bring either life or death. My children act like heroine addicts when they can’t get sugar/carbs!!! The food is all laced with seratoninand dopamine, it is a proven fact!! The wheat proteins hijack the blood sugar and make you crazy!!!! Such a shame that children are exploited by all in power… I see the truth and live it.. it all starts with damaging the gut from the go food, then food allergies from gut damage, then constant histamine effects wreak havoc over time. You will get a disease diagnosis and pills from Dr. But never get better. Go get a blood test for food allergy and take your lives back!!! We are starting a farm so we can discern what is safe to eat. Dr. Greene, I have a child that has “behavioral issues” who is 9 years old. He is in a special needs program at school. However in the last year it has become VERY obvious that his behavioral issues primarily occur when he has a sugary meal. This does not have to be pancakes or waffles, he also reactes to orange juice, goghurt etc. I have another boy and he has no reaction whatsoever to these foods. I am not a researcher however my anecdotal experience shows me that all children are different and some just cannot manage a sugary diet and the accompanying adrenaline rush. Everybody has their own individual reaction. Mark, This has been our experience as well. Of four kids, we could only detect behavior changes in one when high glycemic index foods were eaten. Not that high glycemic index foods are good for any of us, but certainly some kids have more trouble modulating behavior after eating them than other kids do. Thanks for sharing your observation. I have this same issue with one of my children and reading all the “studies” on-line stating that there is no scientific proof that sugar effects behavior is total BS!!!! I agree with that because my daughter’s behavior changes drastically whenever she intakes any amount of sugar. She becomes very intolerant and starts to do things that she normally does not do. They are putting children on non gmo diets and they are being healed of autism, ADD and all sorts of other illnesses. It is not the shots but the food!!!! You are feeding your kids coca in if you feed them gmo foods. Try to eliminate the store bought food for a week and see how your children think, act and learn.. it is night and day!!!! My 3 yr old wakes like me at 2 to 3 am if she has any of this crap!#! It’s like clockwork! !!! I wish pharmaceutical companies would have never infiltrated our medical schools..
Dr. Greene. I am currently researching how sugar alter our moods. I’m also learning more about whether sugar is addictive. This blog post from you is very helpful for me.